Featured speaker, “The professional connection.” Spoke at local networking event for young professionals along with Shelby County Mayor Mark Luttrell. (January 2014). Featured speaker, “Let’s tweet about it.” Carpenter Complex Community Center, University of Memphis. Student/resident assistant asked me to talk about social media with a group of undergraduate students. (October 2013). Featured speaker, “Social media: What’s new, who is using it, and why.” Memphis Commercial Appeal. Spoke to about 35 editors and reporters at request of the executive editor. (April 2013). Featured speaker, “Tapping into social media.” Society of Professional Journalists conference, University of Mississippi (April 2013). 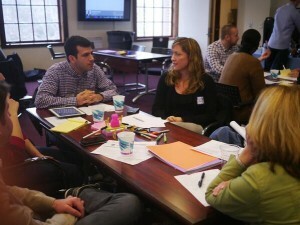 Invited facilitator, Lunch With a Leader. University of Memphis celebration of Women’s History Month. (March 2013). 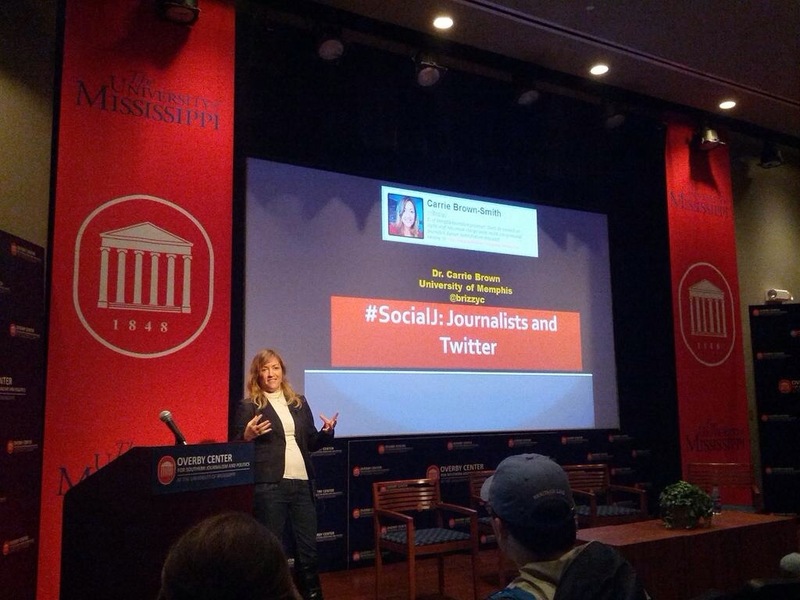 Featured speaker, “#SocialJ: Journalists and Twitter.” Meek School of Journalism and New Media at the University of Mississippi. (October 2012). Invited speaker, “Education session on social media.”Phi Kappa Alpha Fraternity. (August 2012). Invited panelist, “The state of newsroom innovation.” American Society of Newspaper Editors. (November 2011). Featured speaker/discussion leader, “Storytelling for the mission.” Nonprofit Leadership Collaborative of the Midsouth Fall Workshop. (November 2011). Featured speaker, “Going social: The power of new media and your career.” Career and business development event sponsored by National Association of Multi-Ethnicity and National Association of Black Journalists at University of Memphis. (September 2011). Webinar leader, “Going beyond Facebook: Teaching social media in the classroom.” American Advertising Federation. (March 2011). Featured speaker, the Kiplinger Program in Public Affairs Journalism at Ohio State University, the first social media fellowship for journalists in the nation. Fellows came from top newsrooms around the world, including: The Washington Post, 60 Minutes, Frontline, USA Today, Los Angeles Times, NPR, The Kyiv Post, Chicago Tribune, El Tiempo and many more. (March 2011). Invited Panelist, “Social Media and Local Journalism,” Brown Bag Lunch. Memphis Social Media Club. (2010). Invited Panelist, “Extra, Extra, Tweet All About It,” hosted by the University of Oregon. A few of the other panelists: Ryan Teague Beckwith, deputy editor at Congress.org; Mathew Ingram, then-communities editor at the Toronto Globe and Mail; Brian Stelter, reporter who covers television, digital media and more at The New York Times. (Fall 2009). Speaker, “Managing Change Summit,”hosted by Committee of Concerned Journalists and Reynolds Journalism Institute, held in Washington, DC. Attendees included senior editors and top executives from the New York Times, Politico, American Public Media, Gatehouse Media, and many others. (2008). Speaker/panelist, Curtis B. Hurley Symposium, “New Media, Enduring Values,” National Press Club event, Washington, D.C. (October 2007). Invited panelist, “Goodbye disruption, hello disintermediation.” Association for Education in Journalism and Mass Communication conference, Montreal, Canada. (August 2014). Invited panelist, “Teaching entrepreneurial journalism.” Association for Education in Journalism and Mass Communication conference, Washington, DC. (August 2013). Invited panelist. “Presenting the best of the best student journalism entrepreneurs.” Association for Education in Journalism and Mass Communication conference, Washington, DC. (August 2013). Invited panelist. “Participatory journalism.” Association for Education in Journalism and Mass Communication conference, Washington, DC. (August 2013). Session chair, “Participatory journalism: Reimagining the role of audiences and journalists.” International Communication Association conference in London, England (June 2013). Invited panelist, “The Digital Curators: Finding the signal in a sea of noise.” Association of Education in Journalism and Mass Communication conference in Chicago, IL (August 2012). Invited panelist, “We’ll Do it Live: Real-time Reporting Without Regrets.” Association of Education in Journalism and Mass Communication conference in Chicago, IL (August 2012). Invited panelist, “Location, Location, Location: Using Location-based Services to Add some Mobile to your Journalism Course” Association of Education in Journalism and Mass Communication conference in St. Louis, MO. (August 2011). Invited presentation, Brown, C. and Arant, D. “Facebook, Twitter, and Journalism: What Social Media Means For Objectivity and Verification in the Digital Age.” College Media Advisers conference, New York, NY (March 2009).